At the time I scheduled this review I had not thought about what I would be teaching in my classroom around the time this review was due. It just worked out that we are reading stories on disasters. 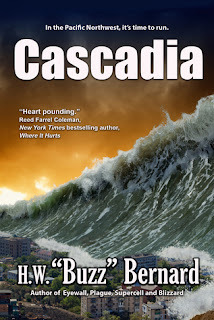 My students have been reading about Tsunamis and the earthquakes that cause them, specifically the 2004 tsunami. An interesting point in the article they read dealt with geomythology. Scientists are using stories told by Native Americans to back up stories of earthquakes and tsunamis that occurred in the past. Those were things I thought about as I read this wonderful thriller by “Buzz” Bernard. One of the reasons I really like his work is you can tell how much research he does. I’m not sure how difficult that is for him with his background. I felt like I was reading a real life event. His main character has to face one of the biggest challenges of his life. 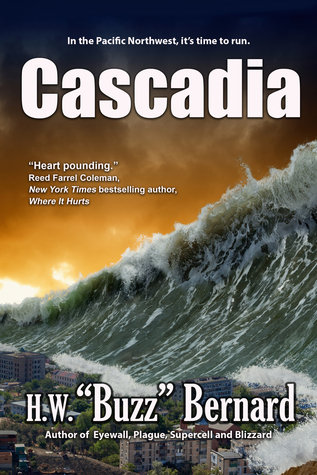 Dr. Elwood is a geologist who keeps having nightmares about a quake that devastates the northwest coast. The more he has the dreams the more he believes the quake will actually happen. The challenge he faces is whether he should risk his career to go public with what he ‘believes’ will happen or if he should keep quiet to protect his career. If he is wrong it would be career over. If he doesn’t tell anyone and his dreams come true then he lost the opportunity to save lives. I wondered if meteorologists and geologists ever actually go through this. I found it interesting that the “Thunderbird and Whale” reference was also mentioned in the articles my students read. This is such a well-written book I could see it as a movie. I want a book like this that will keep me reading from cover to cover. I enjoy books that are so realistic I wonder how much truth there is to them. I definitely recommend you read this book and any of his other books. You won’t be sorry you checked out this author.